What else could I call this article? Baked Electrician? Sunnyside Up? Some Like It Hot? Attitude Is Everything. Attitude Determines Your Altitude! I guess they would all suffice as alternate titles. Anyway, Last Saturday I worked in a customer’s home. During the first hour or two, I spent inspecting all of the wiring, mostly old wiring and handyman wiring. I told the customer that this electrical work would take at least two or three weeks to repair, replace, and correct everything. I asked the owner about his priority for the work to be done. The customer’s top priority was correcting the three-way wiring between the first floor hallway lighting and the second floor hallway lighting. The homeowner had another electrician help him a year earlier. They were able to pull a cable from the new first floor hallway fixture that was added a year earlier to the attic via the basement. The strange thing about this was the electrician stopped there. He never finished the job he started. The other electrician left the hardest part of the job to the homeowner to figure out which box to tie the cable into and which wire to connect the new cable too. That was very poor service to a very nice homeowner. The homeowner did find a hot conductor but he was not able to find the switch-leg so the new first floor light fixture would turn on and off with the second floor light fixture, both off of the two three-way switches. Since the homeowner tied his new cable feeding the new first floor light fixture unto a hot conductor, the light fixture was always on. What good did the other electrician do? Anyway, the temperature outside was 90 degrees, I knew the attic would be hot. There was a passive attic vent in the roof, another smaller passive vent but way too tiny to allow an adequate cross flow of air for ventilation. The attic was hot and humid, even painfully hot but I needed to find the cable and correct the wiring so both lights operated off the two three-way light switches. 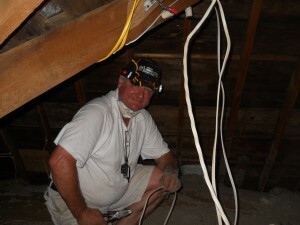 As I crawled around in the attic, I thought how hot, humid, and miserable it was in the attic. I told myself I should just think of it as the steam room I use at Bally’s Total Fitness in my spare time, spare time I seldom have. I know a steam room is 110 degrees to 120 degrees with 100% humidity, this attic was a lot hotter. I would guess it was 140 degees but I did not get my thermocouple temperature probe from my electrical service van. As soon as I did that, my attitude changed for the better, the bonus was it felt like the temperature instantly dropped 20 degrees to feel more like the steam room and less like an oven. It was now tolerable. Attitude is everything. This entry was posted on Friday, August 5th, 2011 at 1:00 am	and is filed under Uncategorized. You can follow any responses to this entry through the RSS 2.0 feed. You can skip to the end and leave a comment. Pinging is currently not allowed.